Financial institutions are in the throes of a perfect storm. Digitalization, increasing regulatory and investor demands, and a shift towards responsible investment are colliding at unprecedented speed. Before 2008, these risks were inadequately estimated. Small cash reserves posted against the risk were not in touch with market reality. Almost a decade on, Artificial Intelligence (AI) technology offers the sector a new dawn. A more comprehensive way to quantify risk has arrived, and financial institutions worldwide are taking note. We’re now in the midst of the Fourth Industrial Revolution, where technology is unlocking untapped human creativity. We’re witnessing an exponential increase mandatory disclosure requirements. According to Datamaran, there are 17 times the amount of requirements today than four years ago. The increase in disclosure requirements is exemplified by several key regulations. In the US, the Dodd-Frank Wall Street Reform initiative was introduced in 2010. While In the UK, the much publicised Modern Slavery Act entered into force in 2015. More recently still, the EU Directive for the Disclosure of Non-Financial Information (see Datamaran’s guide here) became active in the last few months. Today, $1 out of every $5 USD is invested according to socially responsible investment (SRI) strategies today. A recent State Street survey of 457 global institutional investors shows that the integration of environmental, social, and corporate governance (ESG) issues into investment strategy have significantly improved returns for more than two-thirds of these firms. Navigating these market changes, and the more nebulous challenges they present, demands a response. Agility, strong governance and a rapid response are all important traits. However, these qualities have traditionally not come naturally - until now. For the past 3 years, we’ve been working with leading global banks and hedge funds. These firms are embracing a new generation of thinking and operating. This is made possible only through the combination of AI and human expertise. ​"New technologies, like artificial intelligence and big data analytics can help to identify, understand and monitor trends more quickly. Santander has made inroads in benefiting from these new developments, incorporating Datamaran at the center of processes in prioritizing sustainability issues." Navigating these market changes, and the more nebulous risks and opportunities that they present, demands agility, strong governance and rapid a response. These qualities have traditionally not come naturally - until now. For the past 3 years, we’ve been working with leading global banks and hedge funds who are embracing a new generation of thinking and operating. This is made possible only through the combination of AI and human expertise. Why is more capital directed to SRI? Financial institutions are in the throes of a perfect storm. Digitalization, increasing regulatory and investor demands, and a shift towards responsible investment are powerful new forces to navigate. We saw in 2008 that these risks were inadequately estimated. Small cash reserves posted against the risk were not in touch with market reality. Almost a decade on, AI technology offers the sector a new dawn; a more comprehensive way to quantify risk has arrived, and financial institutions all over the world are taking note. We’re witnessing an exponential increase mandatory disclosure requirements. According to Datamaran, there are 17 times the amount of requirements today than four years ago. This is exemplified by Dodd Frank, the UK Modern Slavery Act and the EU Directive for the Disclosure of Non-Financial Information (see Datamaran’s guide here). Today, $1 out of every $5 USD is invested according to socially responsible investment (SRI) strategies. What has Artificial Intelligence Changed? AI technology and big data analytics enables a more dynamic and proactive approach to risk management. Decision-makers can rely less on intuition and have more time and resources available for critical thinking. A data-driven approach is proven to drive better results internally and within the wider network. Specifically, new technological capabilities help banks de-risk through identifying “blind spots”. Instant insights help to highlight connectivity or patterns that were previously unknown. More specifically, these new technological capabilities help banks de-risk through identifying “blind spots” - and help see connectivity or patterns that were previously unknown. If banks can identify these hidden risks and mitigate them - an immediate impact will be a significant reduction of required cash reserves. De-risking has been the name of the game since 2008. No human can analyze thousands of corporate reports, the regulatory landscape, millions of tweets and thousands of news articles at the speed and reliability that Datamaran can. ​​"If banks can identify these hidden risks and mitigate them - an immediate impact will be a significant reduction of required cash reserves. De-risking has been the name of the game since 2008. No human can analyze thousands of corporate reports, the regulatory landscape, millions of tweets and thousands of news articles at the speed and reliability that Datamaran can." Jean-Philippe Lecourt, CFO & Co-founder of Datamaran (Former co-Head of US Equity Derivatives trading Bank of America, and Deputy Head of Prime Brokerage Risk Management BNP Paribas). Jean-Philippe Lecourt, CFO & Co-founder, Datamaran (Former co-Head of US Equity Derivatives trading Bank of America, and Deputy Head of Prime Brokerage Risk Management BNP Paribas). It’s no wonder financial giants like Goldman Sachs are waking up to this new reality. Only recently, Goldman began leveraging similar techniques to assess corporate behavior through reporting narrative. Stories move markets, and we now have ways to quantify and measure those stories in an objective, comparable way. Additionally, replicable narrative analysis overcomes the challenge of data comparability. It’s often said that this is the biggest hurdle to effective integration of non-financial issues into strategic and investment decision-making. It’s no wonder why financial giants like Goldman Sachs are waking-up to this new reality, only recently leveraging similar techniques to assess corporate behavior through reporting narrative. Stories move markets, and we now have ways to quantify and measure those stories in an objective, comparable way. We asked a selection of our financial services clients to explain how Datamaran benefits their business process. This includes supporting benchmarking, materiality assessments, integrated enterprise risk management and portfolio analysis. We asked a selection of our financial services clients to explain how Datamaran benefits their business process - from supporting benchmarking, materiality assessments, integrated enterprise risk management and portfolio analysis. ​"​Data-driven materiality helps us to take better strategic decisions." This evidence-based approach offers insights into both current and emerging issues. Consequently, these issues signal to risks and opportunities - now and in the future. As evidenced by the Financial Stability Board’s Task Force on Climate-Related Financial Disclosures, forward-looking assessments on non-financial issues are gaining importance given the medium- to longer-term risks and opportunities that they present. Scenario analysis is an important and useful tool for companies. Simply, it is used to better understand the implications of associated risks and opportunities. This informs stakeholders about how the company positions itself in light of these issues. Furthermore, the ability to scan the horizon at scale is critical. It enables an understanding and engagement of the issues on a continuous basis. This is why an expert Technical Advisory Group collaborates with Datamaran’s legal, risk, finance, ESG and consulting experts. The issues we track reflects both current and emerging business issues. 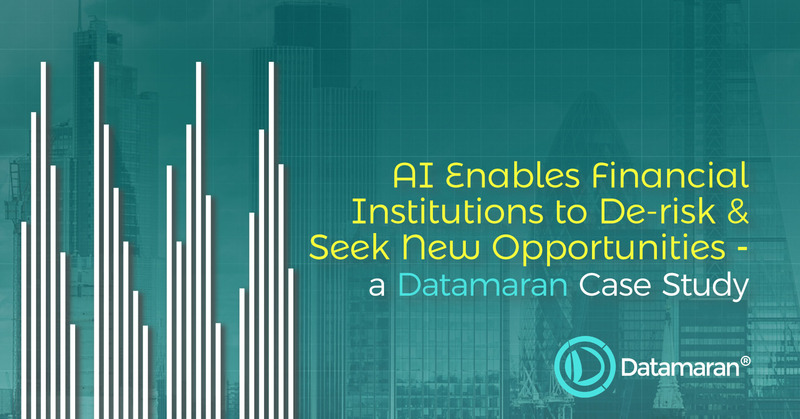 You can read more about What Intelligent Machines Can Tell Us About Emerging Issues; and why Datamaran has built a dedicated Scenario feature. This evidence-based approach offers insights into both current and emerging issues that signal to risks and opportunities - now and in the future. As evidenced by the Financial Stability Board’s Task Force on Climate-Related Financial Disclosures, forward-looking assessments on non-financial issues are gaining importance, given the medium- to longer-term risks and opportunities that they present. Scenario analysis is an important and useful tool for companies to use to better understand the implications of associated risks and opportunities, and to inform stakeholders about how the company positions itself in light of these risks and opportunities. Having an ability to scan the horizon at scale is critical to support this type of understanding and engagement on a continuous basis. This is why an expert Technical Advisory Group collaborates with Datamaran’s legal, risk, finance, ESG and consulting experts to ensure that the issues we track reflect both current and emerging business issues (read more about What Intelligent Machines Can Tell Us About Emerging Issues here); and why Datamaran includes a Scenario feature. ​"​Datamaran allows efficient yet thorough gathering of evidence needed for well-informed strategic decision making. 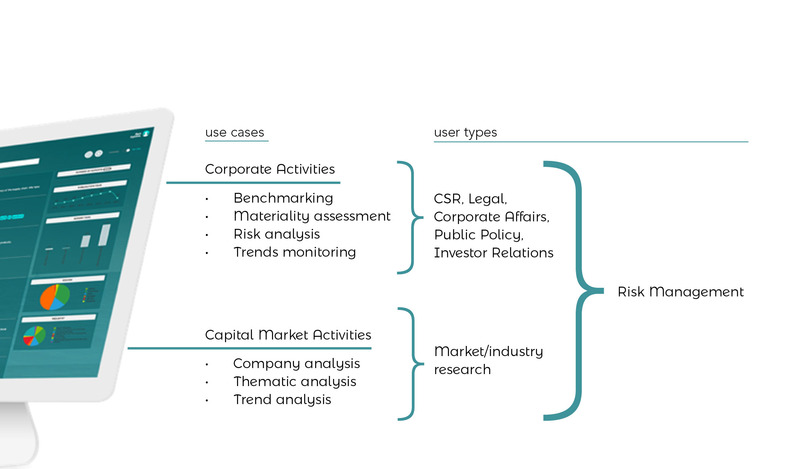 With insights and data, it supports our materiality assessment, peer analysis and trend monitoring activities." Datamaran tracks narrative around 100 issues across multiple stakeholder sources. This includes: 7,000+ companies and their corporate reports, the regulatory landscape (soft norms and hard law) and online social media and news sites. Datamaran tracks narrative around 100 issues across multiple stakeholder sources - 7,000+ companies and their corporate reports, the regulatory landscape (soft norms and hard law) and online social media and news sites. ​"​Datamaran’s unique and power datasets provide me a clear advantage to quickly assess the valuable relationship between non-financial information and financial performance. A robust methodology I can trust and easily integrate into my investment research, portfolio management and monitoring process. A solution only offered by Datamaran." ​Non-financial disclosure is often seen as a cost. More and more evidence shows that increased disclosure attracts investments and mitigates risks. Align this with continuous monitoring of non-financial issues, and operational excellence results. Interested in learning more about how Datamaran can also help you make de-risk and seize opportunities? Get in touch. Non-financial disclosure is often seen as a cost. More and more evidence shows that increased disclosure attracts investments and mitigates risks. Align this with continuous monitoring of non-financial issues, and operational excellence results. Not a financial institution? No problem. These benefits apply to companies across all industries and markets worldwide. Listen to this webinar The New Realities of Risk Management - Integrating ESG into ERM. This webinar features corporate leaders from BBVA, AEP and Mahindra Sanyo Steel. Catch up now to find out how companies are managing this new business reality.